In November the Committee reported that it had visited the site and had consulted with the builder, who had started work on the buildings. On Sunday June 11th all roads led to Melrose. It was a glorious day with enough warmth in the sun to make coats unnecessary Four hundred and sixty cars of every make and colour were parked in straight ranks at the front of the Centre site, and Mound Remarkable stood majestically in the background, slightly amazed at the unusual spectacle of two thousand church people assembling round her feet. Visitors arrived from everywhere and the bishop was overjoyed to see some of his old B.C.A. friends from Ceduna. They had left on their 300 mile journey at four that morning and were going straight back after the afternoon’s doings were over. Every parish and district in the Diocese was well represented and the gathering was indeed fully diocesan. St Peter’s School was represented by Mr Schubert, and his presence was a reminder that it was the keen interest of the late headmaster of St. Peter’s that started us off in the venture. The late Mr Gordon secured the consent of the trustees of the Nicholas Bannon Search Fund to the transfer of the balance of£500 from the fund to establish a memorial to Nicholas Bannon at our Centre. The father of the boy who was lost in the Flinders Ranges, Mr. Charles Bannon was also present. The ceremony was simple and impressive. His Grace first declared open the Kitchen and DiningRoom Block. This Block is named “The Pioneer Block” in memory of the parents of Messrs W. and L. Bishop of Melrose who gave the site. The Archbishop accompanied by the Bishop of Willochra, the Archdeacon, Canon N.S. James and Mr Charles Bannon then proceeded to the first dormitory wing, named “The Nicholas Bannon Wing” and carried out the same procedure there. The party then proceeded to the second dormitory and declared that open also. The second dormitory is named “The American Wing” to perpetuate the gift of $1,000 from an American friend of the bishop’s and gifts from other friends in the United States. The Archbishop commended the venture and spoke of the great value that such a Centre can have in the life of a diocese such as Willochra. After the service everybody had a good look at the interior of the buildings. I think that most of them were more than satisfied with the good job that had been done. Anglicans in this diocese now have a Centre for diocesan life of which they can be truly proud. We hope that they will use it for the building up of their own spiritual life and that of the Church of God in this part of South Australia. The first Camp for teenagers at the newly opened Centre took place on the weekend of July 28-30, 1961. 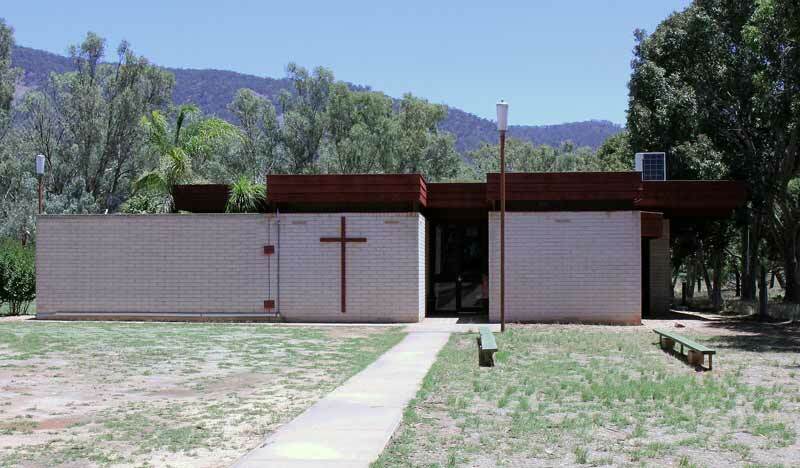 Organised by Rev’ds Conrad Patterson, then assistant curate at Port Pirie and Ian Barlow, then assistant curate to the bishop in Gladstone and who were then both still Deacon’s orders; twenty young people from the Port Pirie Young Anglican Fellowship and half a dozen from Gladstone and Laura proved the effectiveness of the Centre as a place for activity, study, worship and fellowship. The Rev’d George Fuhrmeister and his wife, of Quorn, organised the first Camps for young children during the August/September school holidays that same year. There were 38 boys one week and 29 girls the next with two cooks and three or four leaders for each group. On a Sunday in October a Diocesan Sunday School Rally was held, when children from the Sunday Schools of the Diocese were bought together at the Centre. They competed in Bible reading and hymn singing contest but most importantly became aware that they wee not alone in their little groups, but were part of a large Church. These Rallies continued on for a number of years, organised by the Rev’d Karl Luders, of Crystal Brook. The Synod of the Diocese met at the Diocesan Centre for the first time on November 27th and 28th, 1961. Members were required (as indeed campers still are) to bring their own sheets, pillow slips, towels and blankets. In reporting on the Centre to the Synod, Bishop Jones spoke of the need for a swimming pool if the Centre was to be used in summer and the necessity for a chapel. In “The Willochran” of April 1962, the Bishop reported on the possibility of adding to the accommodation at the Centre. The State Government was selling transportable houses from Radium Hill where the radium mine was being phased out, and consequently the village being shut down. Churches were offered houses for £50 each! To be landed on the site at Melrose would cost the sum of £140 including the carnage for the 160 miles (257Km)! The buildings were 48 feet (14½ meters) by 12 feet (3½ meters) and required only minimal repairs and painting. Four were purchased: one was to become an assembly room and so free the dining room from its unsatisfactory dual use; one would form the nucleus of the caretaker’s cottage; and the other two would become dormitories. This would provide accommodation at the Centre for up to 80 people at any one time. By April 1963 the swimming pool was in situ with the surrounding lawn to be planted and a fence erected. Men from Port Augusta reconditioned the new assembly room while men from Port Pirie wired, repaired and painted the two dormitories and men from Jamestown were called upon to realign one of the buildings after a “willy-willy” had displaced it. A cook at the Mail Bag Sunday School Camp at this time reported on the well-equipped kitchen, with refrigerator, two stoves (wood-fired), electric toaster which coped with six slices at a time, meat and bread cutter and cooking and baking dishes of many shapes and sizes. With the completion of the restoration of the caretaker’s cottage, Mr Jim and Mrs Val Curyer were appointed as caretakers, and took up their work in early 1964. Mr George Miller, a leading layman from our linked Diocese of North-West Texas, visited this Diocese briefly in 1967. As part of that Diocese’s determination to help us, the people there undertook to assist us in the provision of a chapel. The Rev’d Don Francis of Quorn, who had been an architect prior to his ordination, drew up sketch plans for the proposed chapel, which were then passed on to Mr Cheesman, the architect who made the working drawings and supervised the construction. The then Bishop of North-West Texas, the Right Rev’d George Quarterman, accompanied by the Rev’d Jacques Washington of Lubbock, visited the Diocese of Willochra in May 1969. On Sunday May 11th, Bishop Quaterman dedicated the Chapel of Christ the King, the building of which had been made possible by money from his Diocese. An estimated crowd of 1,000 people were present. Many memorial gifts went into the furnishing of the Chapel. The Altar was given in memory of Christopher Hardy, by his brothers Daryl and Ian, while his parents gave the prayer-desk and seat. A Christus Rex crucifix was donated by members of the Church of England Boy’s Society branch of Port Pirie, led by the Rev’d Conrad Patterson. The terracotta altar candleholders were made by Mrs Lee Mills, of Tumby Bay, with the brass inserts made by Mr Mel Lethbridge, of Port Pirie. The Bishop’s chair commemorates Bishop Jones’ 10 years episcopate. The chalice and ciborium were originally given to Bishop Jones on his consecration in 1958. A silver chalice and paten were given by Archdeacon Daunton-Fear, of Adelaide in memory of his mother. Another paten, lavabo bowl and Spanish silver cruets were given by the Servers’ Gide of St Laurence, St Stephen Chapter, i.e. of this Diocese, while a pyx came from the closed St Faith’s Chapter, Little Spring Creek. A white pall cover was made and embroidered by Mrs Beryl Wallbridge of Port Hughes, and red, green, and purple burse and veil sets sanctuary kneelers were designed and made by members of the Diocesan Mothers Union representing various aspects of life of the Diocese. 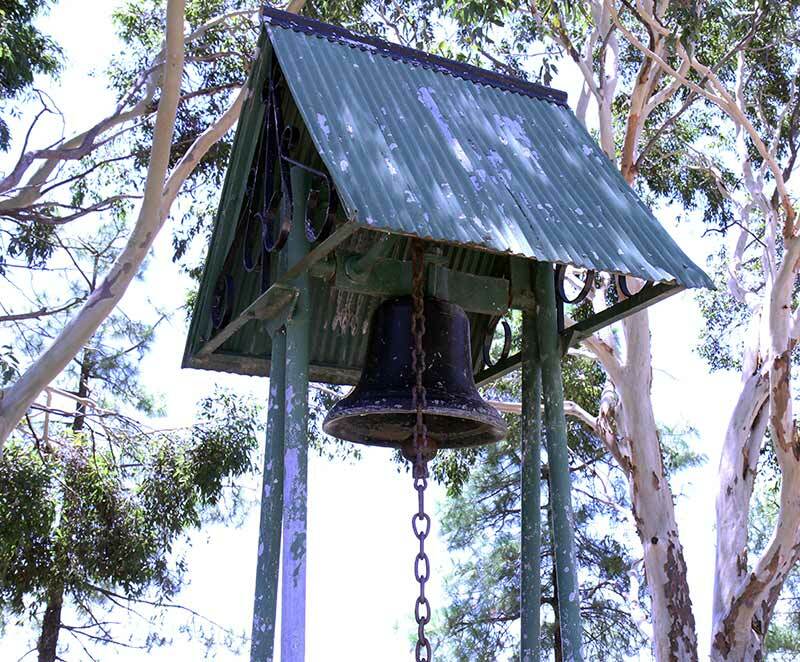 Outside the Chapel, the bell and bell tower came from the closed St Mary’s Church, Booleroo Centre. Bishop Jones retired from his episcopate as Bishop of Willochra on 31st October 1969. The history of Camp Willochra was compiled by Canon Ian Barlow.